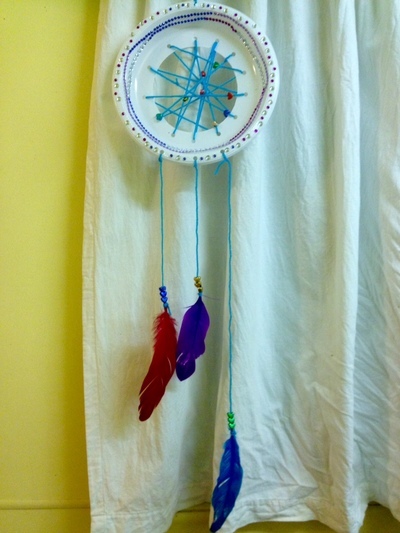 This dream catcher look beautiful hanging in your child's bedroom window. Hole punch holes around the inner circle of the plate. Also punch three holes at the bottom of the plate. And one hole at the top. Have your child cut a long length of yarn, we used approx 60cm. If the end is frayed, use sticky tape to help with threading. Tie the yarn from one of the inner circle holes. Have your child thread beads as they thread the yarn from hole to hole, creating their own design. Once each hole has been used, tie off the yarn. Tie a shorter piece of yarn to each of the bottom three holes. Use sticky tape on the ends if needed. Have your child thread beads onto the three strings of yarn and tie a feather to the end of them. Then move the beads to sit over the end of the feathers. Have your child decorate the plate with stickers. Hang their dream catcher by threading yarn from the top hole to their curtain rod.